In this important film the magnificent Dame Judi Dench plays a singular person rather than just a “type,” such as queen or poor old woman or retiree. She is Philomena, an Irish woman who, while she went on to live an “ordinary” life, kept a secret for 50 years. She has never forgotten the trauma of being involuntarily separated from her illegitimate son. Directed by Stephen Frears (High Fidelity, The Queen, Dirty Pretty Things), the film is based on a book by Martin Sixsmith. Steve Coogan, who wrote the screenplay with Jeff Pope, co-stars. The story is true, and if you want to skip the movie, you can read Sixsmith’s book or his synopsis of the story. If you do, you’ll be missing a great movie. As a young woman unmarried and pregnant, Philomena was sent to live in one of the now notorious Magdalen laundries, for pregnant and wayward unmarried young women, that existed throughout Ireland at the time. The girls were subject to harsh labor, required to take care of their children until around the age of 3, and then forced to sign them away for adoption to rich Americans, who paid a tidy sum for them. 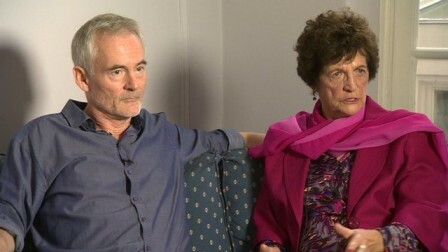 Philomena wants to meet the man she hasn’t seen since he was three, when she saw him driven away in a car with his new parents. She calls upon journalist Sixsmith (Steve Coogan, well-known as comedic Alan Partridge on radio and TV in the UK). Frears and Coogan skillfully combine dire plot twists with the light humor of a road movie. The two travel to America, putting up with each other’s beliefs and personalities along the way. Philomena, in spite of what the “The Church” has done to her, remains a devote Catholic and firm believer. 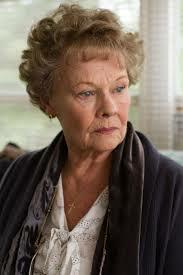 Martin is an outspoken skeptic increasingly disgusted with what happened to Philomena. Furthermore, her delight in romance novel plots isn’t shared by Martin. Martin’s and Philomena’s arguments over matters of faith and morality provide enormous texture to the film, which could have been written as a superficial adventure story under another hand. Instead we get richness of thought and personality. Add to that the information they uncover and the viewer is engrossed. 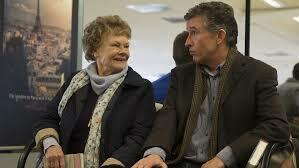 Philomena does learn the new identity of her son and how he grew up, but there are several surprises. Truth is stranger than fiction, as the old cliché tells us. Philomena is a modest woman but far from one-dimensional, embodying a strength that leads her to make important decisions. Martin is frequently taken up short in his thinking about her decisions and his own beliefs. Coogan and Dench make great foils for each other. The rest of the cast is also superb, albeit shadowed by Coogan and Dench. The sisters who were involved are suitably mean, not an exaggeration given the truth of the story. Kudos to all involved with this film. With the incredible competition this year, it’s hard to see that even one of the four Oscar nominations will end up a winner, even for Dame Dench herself. Still, this movie is Oscar worthy and might have won in a different year. And I hope that Dench gets some more roles that truly exemplify her talent, not to mention my desire for more movies that depict old women with actual personalities. NOTE: The real Philomena Lee is involved with others in the Philomena Project, dedicated to getting access to records of more than 60,000 adoptions held by Irish authorities and churches.